On the Friday evening of April 25, 1986, the reactor crew at Chernobyl-4, prepared to run a test the next day to see how long the turbines would keep spinning and producing power if the electrical power supply went off line. This was a dangerous test, but it had been done before. As a part of the preparation, they disabled some critical control systems - including the automatic shutdown safety mechanisms. Shortly after 1:00 AM on April 26, the flow of coolant water dropped and the power began to increase. At 1:23 AM, the operator moved to shut down the reactor in its low power mode and a domino effect of previous errors caused an sharp power surge, triggering a tremendous steam explosion which blew the 1000 ton cap on the nuclear containment vessel to smithereens. Some of the 211 control rods melted and then a second explosion, whose cause is still the subject of disagreement among experts, threw out fragments of the burning radioactive fuel core and allowed air to rush in - igniting several tons of graphite insulating blocks. Once graphite starts to burn, its almost impossible to extinguish. It took 9 days and 5000 tons of sand, boron, dolomite, clay and lead dropped from helicopters to put it out. The radiation was so intense that many of those brave pilots died. It was this graphite fire that released most of the radiation into the atmosphere and troubling spikes in atmospheric radiation were measured as far away as Sweden - thousands of miles away. The causes of the accident are described as a fateful combination of human error and imperfect technology. In keeping with a long tradition of Soviet justice, they imprisoned all the people who worked on that shift - regardless of their guilt. The man who tried to stop the chain reaction in a last desperate attempt to avoid the meltdown was sentenced to 14 years in prison. He died 3 weeks later. Radiation will stay in the Chernobyl area for the next 48.000 years, but humans may begin repopulating the area in about 600 years - give or take three centuries. The experts predict that, by then, the most dangerous elements will have disappeared - or been sufficiently diluted into the rest of the world's air, soil and water. If our government can somehow find the money and political will power to finance the necessary scientific research, perhaps a way will be discovered to neutralize or clean up the contamination sooner. Otherwise, our distant ancestors will have to wait untill the radiation diminishes to a tolerable level. If we use the lowest scientific estimate, that will be 300 years from now......some scientists say it may be as long as 900 years. I think it will be 300, but people often accuse me of being an optimist. If I tell someone that I am heading to a "dead zone"... the best case response is; "Are you nuts?" My dad used to say that people are afraid of a deadly thing which they can not see, can not feel and can not smell. Maybe that is because those words are a good description of death itself. Dad is nuclear physicist, and he has educated me about many things. He is much more worried about the speed my bike travels than about the direction I point it. 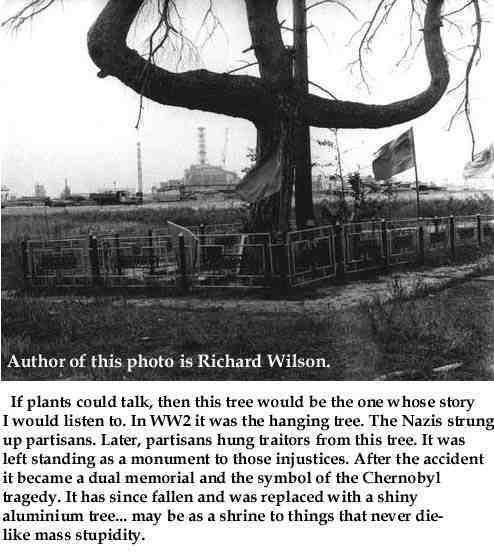 My trips to Chernobyl are not like a walk in the park, but the risk can be managed. It is similar to walking on a high wire with a balancing pole. One end of the pole is the gamma ray emission intensity and the other end of the pole is the exposure time. But the wire is also covered with a slippery dust, and this is the major risk. I always go for rides alone, sometimes with pillion passenger, but never in company with any other vehicle, because I do not want anyone to raise dust in front of me. Dad and their team have worked in the "dead zone" for last 18 years doing research about the day it all happened. The rest of the team is comprised of microbiologists, doctors, botanists and other professions with long names and many syllables. I was a schoolgirl back in 1986 and within a few hours of the accident , dad put all of us on the train to grandma's house. Granny lives 800 kms from here and dad wasn't sure if it was far enough away to keep us out of reach of the big bad wolf of a nuclear meltdown. The Communist government that was in power then kept silent about this accident. In Kiev, they forced people to take part in their preciously stupid labor day parade and it was then that ordinary people began hearing the news of the accident from foreign radio stations and relatives of those who died. The real panic began 7-10 days after accident. Those who were exposed to the exceedingly high levels of nuclear radiation in the first 10 days when it was still a state secret, incuding unsuspecting visitors to the area, either died or have serious health problems. Time to go for a ride. This is our road. There won't be many cars on those roads. This place has ill fame and people try not to settle here. The farther we go, the cheaper the land, the less the people and the better the roads.. quite the reverse of everywhere else in the world - and a forecast of things to come. As we pass the 86th kilometer, we encounter a giant egg - which marks the point where civilization as we know it ends - and the Chernobyl ride begins. Someone brought the egg from Germany. It represents LIFE breaking through the hard shell of the unknown. I am not sure if this symbolism is encouraging or not. Either way, it makes people think, and for us this is our last chance to stock up on edible food, drinkable water and uncontaminated fuel. 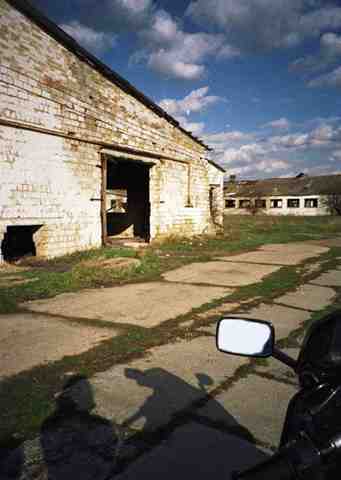 Our journey from here is a gradually darkening picture of deserted towns, empty villages and dead farms..